One practice into the new NFL season and the Dallas Cowboys are preparing to be without the man Coach Jason Garrett has called the “heart and soul” of the defense. 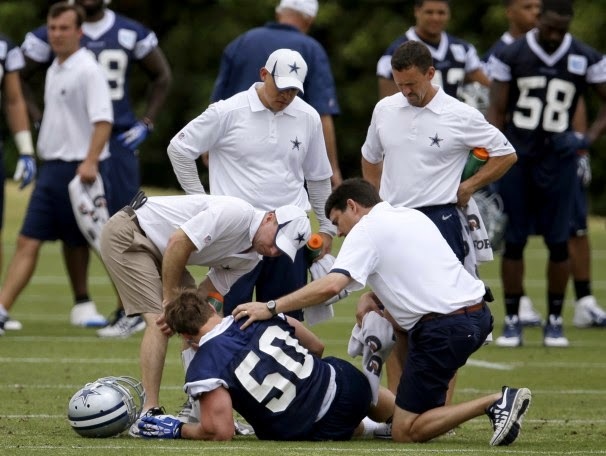 Sean Lee, according to the Dallas Morning News and ESPN, has been told that he has a torn left anterior cruciate ligament and he is expected to miss the entire season. The linebacker was hurt on the first day of noncontact organized team activities when he appeared to slip and his leg gave out as he pursued running back DeMarco Murray on a screen pass. Rookie offensive lineman Zack Martin then fell over the top of him. As he was being helped off the field by two trainers, Lee cursed, and seemed to know immediately what had happened. He has an extensive history of injuries, including knee injuries, and he has had season-ending injuries the last two years.